How is the Battery System on a BMW i8 Recharged? The BMW engineers who came up with the recharging system for the BMW i8 took advantage of some current technologies and invented some of their own. The huge 11.6 kWh ion-lithium battery is strapped to the undercarriage and cannot be accessed except by qualified BMW technicians. So, the engineers came up with a plug-in system and a self-recharging system. Along with the vehicle comes a plug-in cable that accesses either a 120v or a 240v system anywhere in Chico. Using a 240v system will fully charge the battery in three hours. When on the road, the battery is continually recharged up to 80%, and a quick switch to the SPORT eDrive mode shuts down the electric motor, so the power from the gas engine goes directly to the battery. 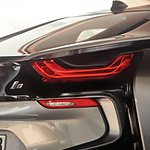 At BMW of Chico, our certified technicians understand and maintain the recharging systems of the BMW i8.